Feel at home from the moment you walk through the front door. Right away you'll notice the pride of ownership and the beautiful upgraded oak trim and moulding throughout. 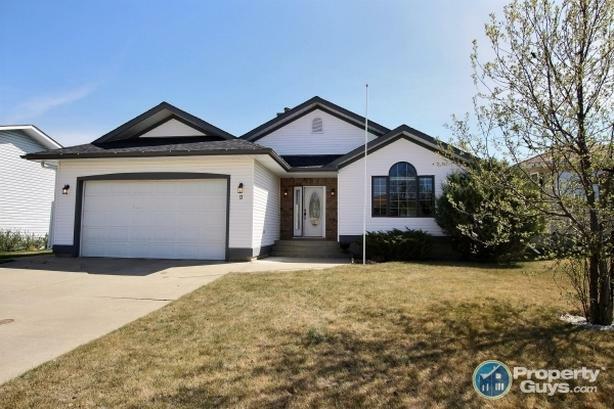 This well kept home boasts 1480 square feet of finished, open concept living space ready for you to call it home. Kitchen: The kitchen offers lots of storage and counter space in this well laid out space. There is a corner pantry and large island with built in drawers and storage, white appliances, garburator and built in under cabinet lights. The kitchen opens up onto the dining area for easy access. Formal Dining: You'll enjoy having a separate formal dining area for those special occasions to host large family gatherings. Great Room: Get ready to curl up and be cozy in this space! This is the perfect family space with oak built in storage along one wall with an oak mantle above the gas fireplace. Large windows let in lots of natural light in this space. Master Bedroom & Ensuite: The spacious master bedroom is on the main level and has a walk in closet as well as a 4pc ensuite. The ensuite features a 2 person corner soaker tub and a corner shower with new glass doors. For sale by owner, buyers can come direct to seller. No solicitation please. Agents with qualified buyers welcome. Call 403-768-0145 or 1-855-742-4539 to book a private showing.